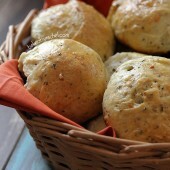 Tender dinner rolls seasoned with onion, fresh garlic and herbs. 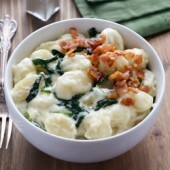 A great addition to any dinner or holiday meal. There’s something about Target that just says – hand over your money because you don’t really need it anyway… or something like that. Right? I mean how often do you walk in there and leave without spending way more than you ever wanted to? It’s nearly impossible. Granted, it’s not like I buy things that are total nonsense… okay maybe sometimes but they always have their uses. Socks for the kids, candy for my belly (totally justifiable), the latest Essie color… all necessary. And don’t get me started on the dollar section and holiday area. Is Target the same way for you? What stores totally sucker you in? Next to turkey and pie… Thanksgiving is all about the carbs. Right? I mean we’ve got stuffing and rolls and potatoes and nom nom… sorry I’m already going into a carb coma. I can’t wait. The things I look forward to most are stuffing, pie, rolls and mashed potatoes. I could *gasp* live without the turkey. Just pile my plate high with everything else and I’d be totally content. This year I’m actually skipping the giant bird and just doing turkey breast. I figure, fewer people and no one eats the dark meat so why waste it. Buy what you’re going to eat. Anyway… rolls… Ever since I was little, rolls have always been a huge part of Thanksgiving. It’s one of those holiday memories that’s permanently ingrained on my brain. Clover rolls make me think of Thanksgiving. That’s *the* roll we have every Thanksgiving and I’m sure it won’t change. It’s just how it is. But I do try lots of others, including this one which is basically a recreation of some of my other favorites. These rolls are soft with a slightly crisp shell. They’re packed with flavor from the onions, garlic and herbs. 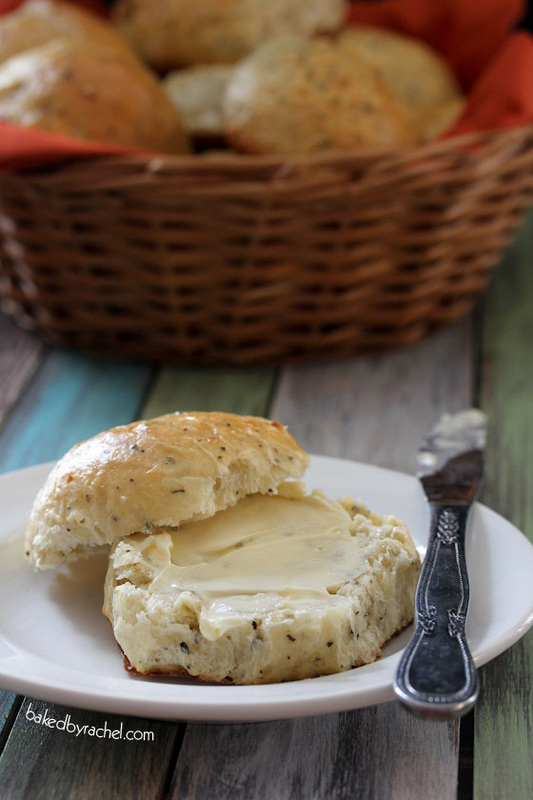 Slather a warm roll with butter and you’ll be in heaven. Heat milk to 115°F. Mix in yeast and sugar. Allow yeast to proof for 5-10 minutes. In the bowl of a stand mixer add remaining dry ingredients and freshly minced garlic. When yeast has puffed up, lock mixer and turn it on low. Slowly add milk mixture and olive oil. Continue mixing until dough pulls away from the bowl. Add dough to a lightly greased large bowl. Cover and allow to rise in a warm location for 1 hour or until nearly doubled in size. Divide dough into 12 equal pieces. Shape into a ball, placing seem side down into a 9x13-inch baking dish. Cover and allow rolls to rise for 30 minutes. In a small bowl beat together one egg with 1 Tbsp water. Brush egg wash over rolls. Bake for 35-40 minutes or until tops are golden. Cool slightly prior to serving. Store leftovers in an airtight container for up to several days. Reheat rolls as needed. 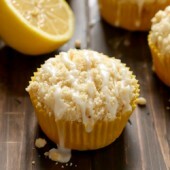 -A stand mixer was used for mixing this recipe. If mixing by hand, it will require extra kneading and elbow grease. -Substitute ingredients at your own risk. I cannot promise how it will turn out if you change ingredients. -As with all baking and bread making, there are many factors that can play a major factor in the final result of the food, including but not limited to weather, elevation, various yeast issues, etc. 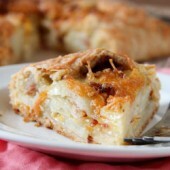 -Add a portion of flour at a time until the dough comes together. Do you think I would have good results by using the bread machine to mix and partially rise this mixture?? I do not own a bread machine so I cannot vouch for how that would change a recipe. If you’re comfortable using it to mix and rise, I’d go ahead and try it that way. Good luck! That happens to me walking into Target. I go in for just detergent and walk out with a cart full of stuff. Crazy! Loving these rolls! Thanksgiving is all about a carb overload for me. And these rolls would be perfect for Thanksgiving or anytime! Yum! If I didn’t actually need stuff there I could totally avoid it but alas… they have stuff I *need* and really do mean that lol. Those look amazing! 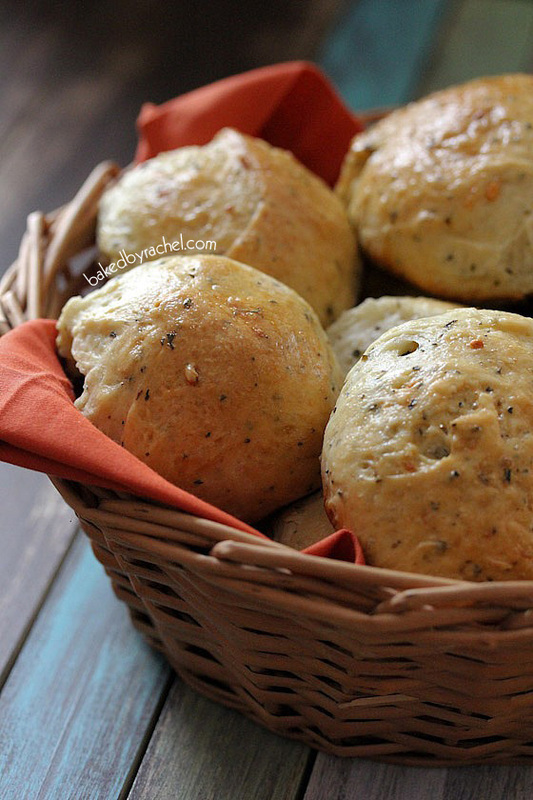 I love homemade bread and garlic and herb is a favorite! I will be making these soon! Yum! These rolls look amazing! I must try them! Has anyone tried it without the egg wash? We have an egg allergy in our house, and so bake everything (cross contamination and all), but good eggless dinner rolls are hard to find. I may try it, but just wondered if anyone had any experience with omitting an egg wash. Thanks! These look phenomenal! I’m sure I’d eat 100 of them. I’m totally with you. I could take or leave the turkey, but don’t mess with my stuffing and rolls! (and I’m not referring to what my midsection will look like after eating Thanksgiving dinner) I love the crust on these. I’m pinning for later! These look lovely, Rachel! I love the addition of the herbs. I totally have the same issue or infatuation with Target. Love these dinner rolls. Thanks for sharing. This may be a stupid question, but is the basil in the recipe fresh or dried? These look so yummy! I’m going to be making them soon! Mm those are my kind of dinner rolls! I so rarely make rolls but I need to find the time for these. Wow, these looks so yummy! I love rolls that have flavor packed into them! I am a sucker for Target and for carbs. Deadly combination. But I love it! These are amazing, Rachel. oh the bread is always my favorite way to start a meal. and with farlic, herbs, and butter..mmm you’re suckering me in! I think I’ve been to Target like 4 times in the past week. It’s a sickness, I can’t help it! Same thing with carbs, I’m an addict. These look great! Hahaha if ours were closer than 20 min I probably would too! Target is so dangerous for the pocket book! These rolls sound so amazing! Need these on my Thanksgiving menu! These are so prefect for Thanksgiving!! You are rocking the Thanksgiving table with your post these days! I’m totally a sucker for Target too. I can’t even go near the dollar section anymore….the seasonal stuff is what gets me now. I want it all! These rolls look delicious – and perfect for sopping up extra gravy! My inner bread-loving-child is smiling right now. I need these in my life asap! I can’t pass through a target store without hitting up the nail polish aisle at least once. I play coy like I’m going to walk past it and then I always circle back around again and just pick up one new polish that I couldn’t leave behind! It needs mee!!! 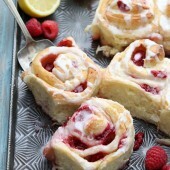 Much like these carby rolls need in my belly!! Gorgeous! Rachel I could just tear up that whole basket of rolls. They look incredible! Target is dangerous for me to go in. I can’t leave without spending a fortune every single time. Why do they have to always have the cutest stuff that I HAVE to have? Now these rolls, I need those too. Forget the turkey…I’m headed straight to the carbs and dessert this year!!! That is a seriously gorgeous dinner roll. I sure would love these on my Thanksgiving table. 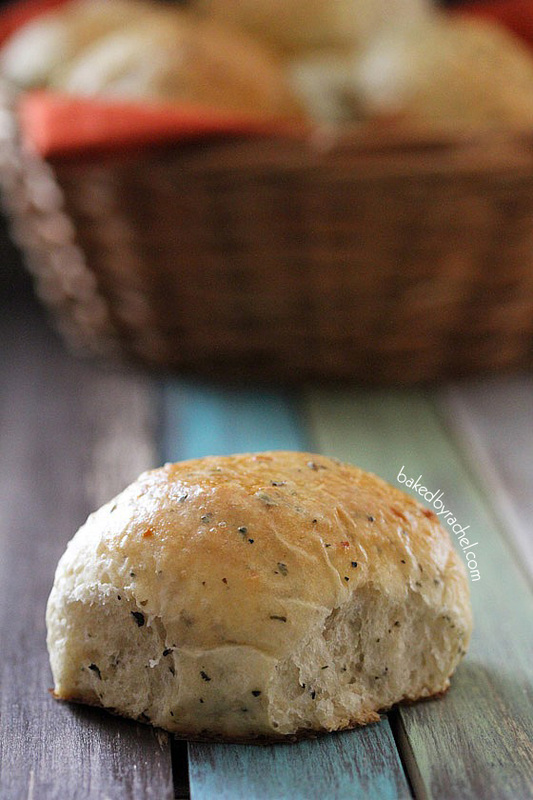 I can’t resist a good garlic roll :) these look fantastic! Target gets me every time. Ugh. 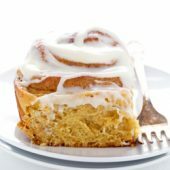 I think I will drown my sorrows in a few of these rolls. 2 questions…what do you grease the baking dish with…butter? Olive oil? Or shortening? Secondly…should I use a glass or metal baking dish? Sorry for the dumb questions…I’m not much of a baker…thanks so much!! Question: Do you think I could make the dough a day ahead and refrigerate until I want to bake? Or would that compromise them somehow? Cheers, sounds delish! I don’t know if anyone else actually tried making this, but this dough is so dry and crumbly!! I could mix it all day and it”ll still be crumbs. I have read this recipe many times and don’t know where i went wrong. They look great, but this recipe won’t get me there. I’m sorry to hear you had trouble with the recipe Lisa. However, as you can see from the photos, the recipe does indeed work and was rather tasty. I am aware of others who have had success with the recipe. If you are mixing by hand, it will require more effort than mixing with a stand mixer. You should always start with a portion of the flour and add additional until the dough has come together, especially when mixing by hand. But that is a good practice in general. 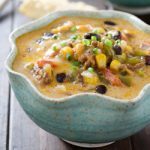 I’ve never experienced that with this recipe and I know others have had great success with it as well. Proper measuring is key. But if you’re familiar with baking then you also know that weather and altitude can play a huge factor. 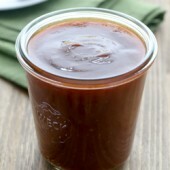 When in doubt, always add a 1/2 cup less and increase as needed until the desired consistency is reached. Oh these look simply delicious, could eat these for breakfast!! I also had a very dry and crumbly dough, so I added water until it was soft enough to knead a bit. It didn’t rise well, and my rolls came out very dense. Still tasty, but a little dry and very dense. I used a gluten free flour, so I thought that may have been the problem. I also don’t have a stand mixer, and had to mix by hand. As noted previously, a stand mixer was used for this. Others have had success. 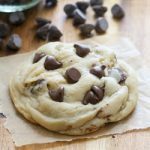 If you mixed by hand, additional kneading is always necessary and substituting ingredients can definitely change the outcome of a recipe as well. When working with bread, you should always judge how much flour you need, adding a portion in at a time. 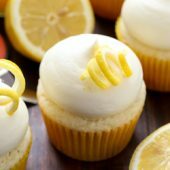 Weather and elevation play a huge role in baking. Wonder if anyone has tried these without milk, or with soy or almond milk? We have a lactose intolerance problem. I haven’t personally tried with a different liquid for these rolls, but I don’t see why it wouldn’t work. These looked like my kind of rolls. Unfortunately, the dough didn’t want to come together and ended up very heavy as was the finished product. I’ve been baking for a long time and I followed directions, allowing for weather, etc.. I may attempt again but will make further alterations to the recipe besides adding more liquid ,which I had already done. (I did make excellent croutons with the rolls I got.) Also, I couldn’t help but notice as I read the comments (after making the rolls) that every baker who actually attempted the rolls had the same problem. I wonder if the recipe was transcribed to the website with an error in it. I ended up using another recipe with my usual good results. I’m sorry you had trouble but the ingredients are correct. Notes were previously added to the recipe to assist in understanding why some may have trouble with this particular recipe. 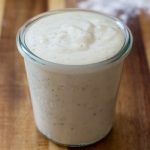 A stand mixer should be used for best results with this recipe and as with all bread recipes, there is a range for both flour and liquid that can be used. Hi, I followed all your measurements but upon mixing it all, the dough was kind of dry. I just added a milk to it in order to give a kneading state, is that okay? One more thing, you don’t need to add the egg to the dough mixture right? it’s just for brushing the top. Within the notes, it mentions to add the flour a little bit at a time until it comes together, due to varying factors. But yes, adding additional milk will help offset any dryness you may have experienced while mixing. The egg is only used for the egg wash at the end.